Bespoke Made - If you require something a little different please call us. We manufacture safety steps at our own UK factory and welcome bespoke orders. 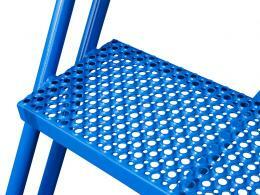 Bespoke Colours - Do you want your safety steps in a special colour? To order a bespoke RAL colour please call our sales team on 0800 0126777. The net price and delivery time might vary. Load Testing - Our Standard Series Mobile Safety Steps have been load tested in 2018 by a UK specialist lifting equipment company who are members of the Lifting Equipment Engineers Association (LEEA). They have been tested to a maximum static vertical load of 225kgs distributed evenly on the platform using calibrated test weights. We are unaware of any other manufacturer that tests to these vigorous standards. What is the purpose of the Standard Mobile Safety Steps? When you need to reach high products in a safe and secure manner, the Standard Mobile Safety Steps are your go-to product. With the ability to move these stairs to where you need them when you need to, they are the top-of-the-line in safety and stability. This product provides your workplace with a stable work platform, and can be an excellent alternative to those who are not confident in using a traditional step ladder. This is a great product to be used in any warehouse or store where items are commonly stored in high, hard to reach areas. Because the mobile safety steps are on wheels, they move around easily to where you need them most. The simple design of these platform steps result in easier movement from one place to another, as opposed to some stepladders proving heavy to lift individually. This is a great product to be used by anyone. The safety features provided make it so you don’t need specialised training to stay safe while climbing the steps and doing your job. These steps are perfect for warehouse workers and stock rooms of large stores where employees need to reach inventory that is placed out of reach, but not packaged in a way that would require a fork lift. 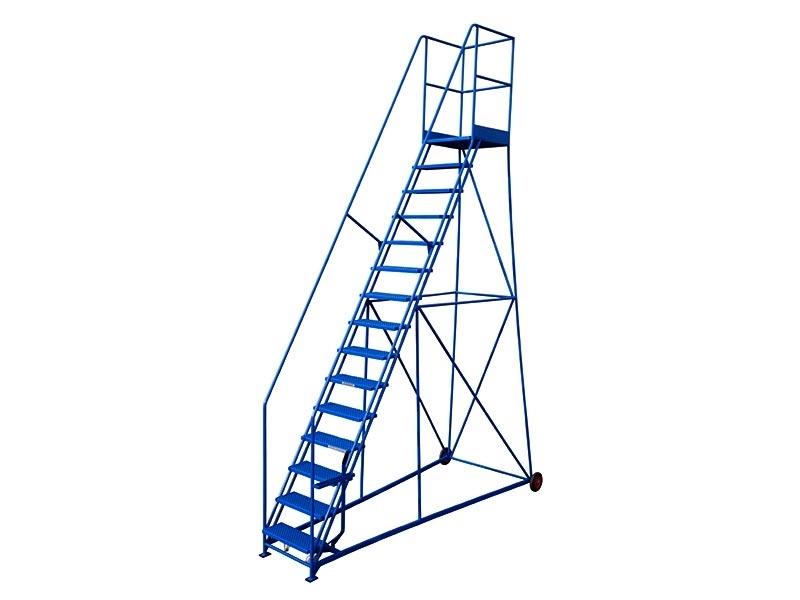 These platform steps give the user the security of industrial scaffolding, and the simplicity of a folding ladder. 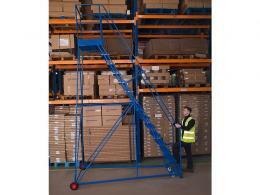 The Mobile Safety Steps are made from fully welded steel construction and is load tested to LEEA standards. Safety support rails are featured on the sides of the stairs for stability and your choice of rubber or punched metal treads keep you from slipping on the stairs. A hand activated locking lever break ensures the stairs stay stationary when you need them to. 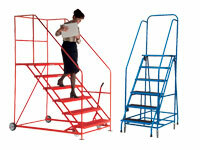 These mobile safety steps are available in two standard colours. For an additional fee, RAL colours may be available. If you are interested in upgrading to a RAL colour, please call and speak with one of our associates. Shipping is free to all mainland UK destinations with a turnaround time of 5-10 working days. All steps are manufactured as custom orders; therefore we will not accept any returns. Please check dimensions carefully before placing your order.